The One Person Who Could Have Prevented The 2008 Recession ... Had He Choosen To Do So. I REALLY, REALLY HIGHLY Recommend This Book to Anyone Interested in Understanding What Truly Caused the 2008 Recession - How can you go wrong for $1.37? Why Write About This Subject? "The Federal Regulators' refusal to reform [predatory] practices and products served as an implicit endorcement of their legality" - Attorney General from Illinois Lisa Madigan in testimony to the Commission. In other words, the Attorney General of Illinois believes that Alan Greenspan believed all of the practices and products used and sold by the mortgage brokers, lenders, banks, and other financial institutions were legal. I knew I had read enough to start writing about it. Why Do I Point To Alan Greenspan in my Hub Title? AS I MENTIONED, the Report is 545 pages long, but, I only needed to read the first 230 before I had no doubt as to why the 2008 recession happened and to know that it didn't have to be the disaster that it turned out to be. What the authors of the Report wouldn't say directly, but is absolutely clear from the facts presented, is that while Alan Greenspan did not cause the great recession, he could have prevented it! 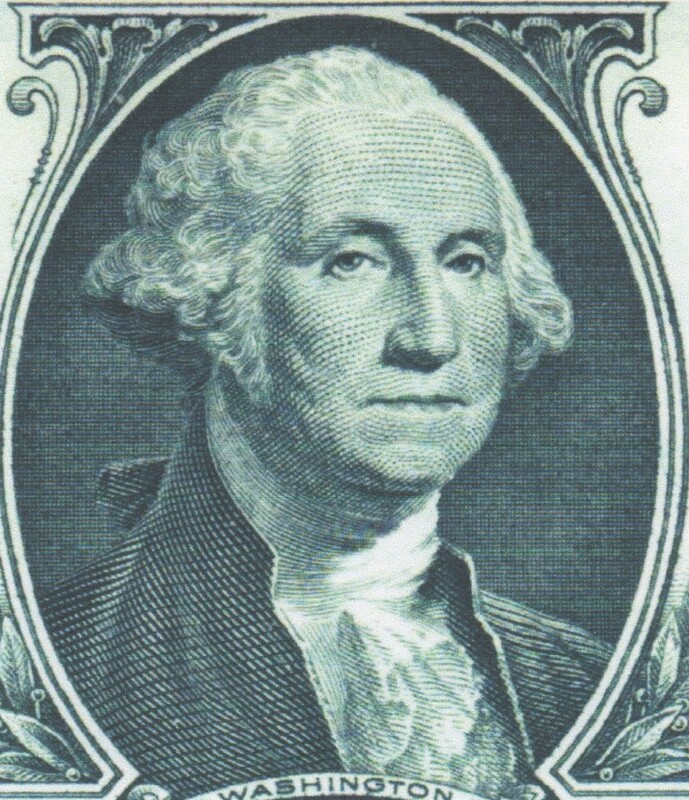 As Chairman of the Federal Reserve, he had the power and authority; he could have ask Congress for more, but didn't. Congress is almost as guilty at not preventing the recession, while, at the same time, being part of the cause as well. As I will show in subsequent sections, Greenspan and Congress had plenty, year worth, of warning that things were seriously wrong with the economy; they had plenty of time to adjust policies to mitigate the impact of what was going so terribly wrong. Could We Have Avoided the Recession Entirely? NO, THAT WOULD have been impossible. 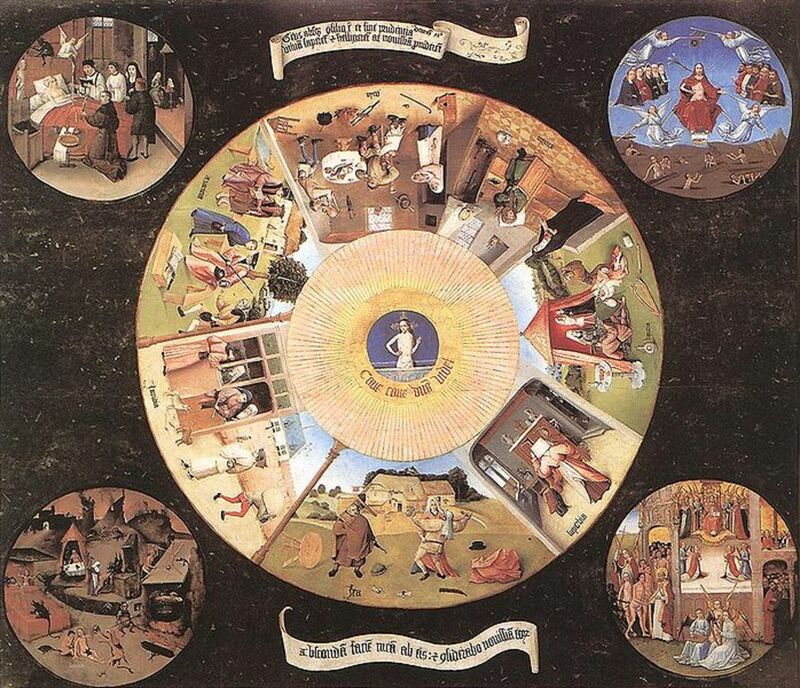 Business cycles are business cycles, recessions will come; recession will go; especially financially based ones such as the one we are recovering from now. But, since the mid to late-1930s, regulations had been put into place to mitigate their severity. Guess what, it worked! This recession was going to happen, sooner or later; they just do. Prior to 1929, there were major financial depressions every five to fifteen years; just think of that, 2008 size economic downturns more than once a generation. Since 1930, on the other hand, there have been zero 2008-size recessions until this one; an amazing 78 years later. But, there were several other types of recessions during those 78 years. In fact, since the 1929 depression, we have only had two financially based recessions, the not too severe dot-com bubble recession of 2000 and the Great Conservative Recession of 2008. All of the other economoc downturns which were classified as recessions by the National Bureau of Economic Research (NBER), 11 in number, were caused by other reasons, mostly government/Federal Reserve actions to prevent the economy from getting out of control. Of these, only three lasted more than a year; 1937, 1973, and 1980; and also only three where unemployment exceeded 8%; 1937 (19%), 1973 (9%), and 1980 (10.8%). For comparison purposes, in the 78 years prior to 1930, there were 21 recessions or depressions (compared to 13 since 1930), of which, 17 were financial in nature (compared to 2) and 16 lasted longer than one year (compared to 3); in fact one (1873) lasted 5 years and 5 months. I don't have unemployment numbers from this period yet but given the size of the decline in business and industrial activity, 19 of them greater than 14% (the range was 9% to 38% with four above 30%! ), unemployment had to be greater than 9% in all of these. I will leave the details of this comparison to another hub, but the difference between the two periods is more than stark, it is persuasive to any reasonable person; something had to be different between these two 78 year periods to account for such an astonishing difference. Well there is. Again, I will leave the logic to another hub, but the conclusion I have drawn is that the difference is the economic philosophy that drove government policy and regulation which, in turn, brings us to one of the principal causes of the 2008 recession. What are these two economic philosophies? The philosophy in place prior to the Great Depression is the one touted by Conservatives today. 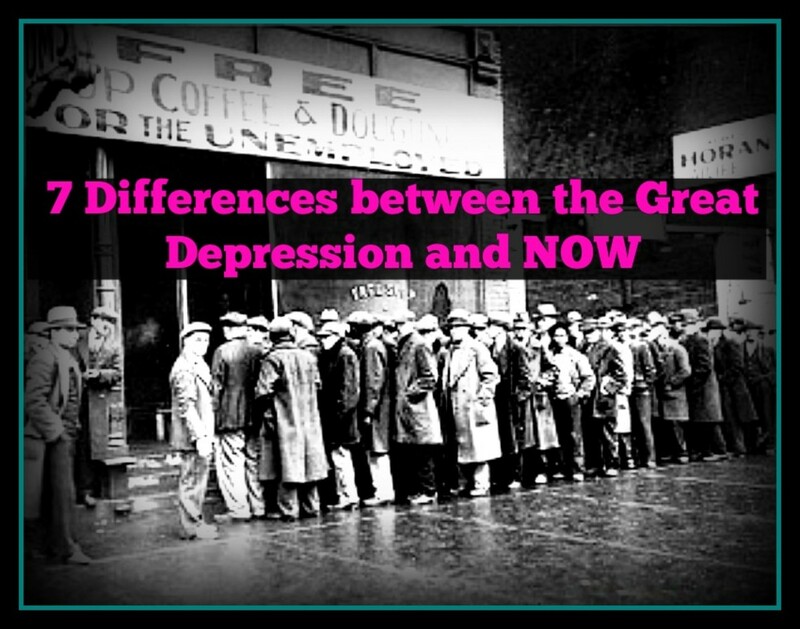 The one used after the Great Depression is what the Democrats favor. The policies created by President Roosevelt, both of them, and subsequent presidents until President Reagan, kept the nation relatively stable, as the previous paragraphs clearly show. Starting in 1978, and continuing until 2009, the Conservatives kept up a long-term campaign to dismantle all of those policies and regulations. The enevitable consequence of returning to the policies of the 1800s was to return to the boom-bust cycle of 1800s and early 1900s; the Great Bush Recession of 2008; if things don't change, that was just a downpayment. Who Was in Charge from 2000 to 2007? CONSERVATIVES! From Alan Greenspan, and this was critical, to the President, to Congress, to the Supreme Court, the Conservative economic philosophy pervaded government policy and action; the same philosophy in place during the 1800s and early 1900s. After reading the Report, it is a no-brainer, in determining why, no action was taken, first by President Bush (TARP), and then President Obama (stimulus), America would be in its first full-blown depression since 1929. At the top of the pyramid sits Alan Greenspan, Chairman of the Federal Reserve Board. Appointed to a ten-year term, in an attempt to take some of the politics out of the appointment, the Chairman is independent of Congressional and Presidential oversight, again to prevent politics from controlling the nations monetary policy. The Federal Reserve Board (the Fed) is a very powerful and influential body, so, its Chairman is as well. The purpose of the Fed is to control America's monetary policy while Congress controls our fiscal policy. The exercise of monetary policy control is to stabilize the money supply and therefore mitigate the wild swings in economic expansion and contraction America saw the first 150 years of our history. 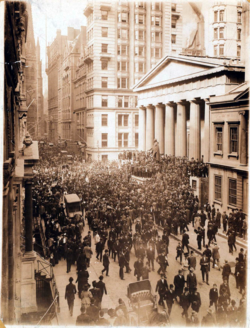 The Fed was created in 1913 in response to the Panic of 1907, caused by Augustus Heinze's failed attempt to corner the copper market. Since then, its mandate has been expand and powers increased to meet the changing needs of the times. Basically, the Fed sets monetary policy and regulations and has oversight of the nations banking institutions. How broad the range of banking institutions the Fed has regulatory authority over was a major part of the debate in the early 2000s has the crisis developed. They clearly had authority over regular federally chartered banks, savings and loans, the government-sponsored enterprises (GSEs), and the like. Less clear are what control the Feds had over the new financial institutions who entered the mortgage market and, in effect, took on the role of banks; but, as the Conservatives intended, were unregulated; just like they were in the 1800s. I will show demonstrably in another hub how these unregulated financial institutions which delt in non-agency securities that provided funding for mortgages were the proximate, but not underlying, cause of the recession. The first question is - "did Alan Greenspan have sufficient authority already granted to him by 109th, 110th, and 111th and previous Congresses to have reigned in the unethical and illegal practices of such institutions as Goldman Sacs, AIG, Merrill Lynch, and others like it?" Another central question is - "Could or should have Alan Greenspan brought the hammer down on the equally unethical and illegal practices used by the banks, over whom he had unquestioned oversight, who were abusing their new found freedom with repeal of the Glass-Stegall Act of 1933?" 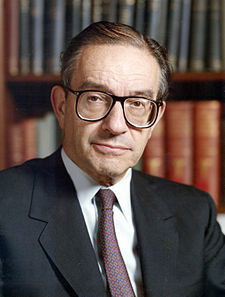 Because Alan Greenspan had so much power concentrated in his position, as it relates to his ability to change the course of the recession, the answers to these questions become key to understanding what 'might have been' had Alan Greenspan held an economic philosophy similar to that of those who created the Glass-Stegall Act.instead of those held by today's Conservatives. WHILE I UNDERSTAND this is a very simplistic observation, but one of the characteristics of Conservative economic theory that everybody is aware if it laisez-faire approach to government involvement with business. The theory is that the less government regulation there is, the more companies will innovate, hire, and grow, taking the economy with them. Alan Greenspan was a firm believer in this theory. I said earlier that the Chairman's position was created to be as non-political as possible; I believe that to be true today. I do not believe that the actions Greenspan took or didn't take were politically motivated; I firmly believe he was doing what he thought was right, according to his conservative economic philosophy. The problem is, his philosophy blinded him to reality. Greenspan stayed the course, believing things were going according to plan even though the warning signs were piling up all around him. Greenspan didn't start reacting until It was too late and near the end of his riegn. It was actually Ben Bernanke, who became the Fed Chairman February 1, 2006, who actually began trying to do something to curb the excesses of what was happening in the financial institutions. Who Was Really Responsible for the Housing Bubble? CONSERVATIVES HAVE TRIED very hard to lay the blame for the "housing bubble" at the feet of the government-sponsored enterprises (GSEs) Fannie Mae and Freddie Mac, who are responsible for buying mortgages from the originating lenders, and the Community Reinvestment Act of 1977; this includes one of the dissenting members, Peter J. Wallison, who wrote a dissenting opinion to the Report and who expanded upon it on his website. The Report does very credible job of debunking both of these positions and I am only going to address the issue regarding the role of the GSEs. To me, the charts to the right speak volumes and are extremely clear and uncomplicated! 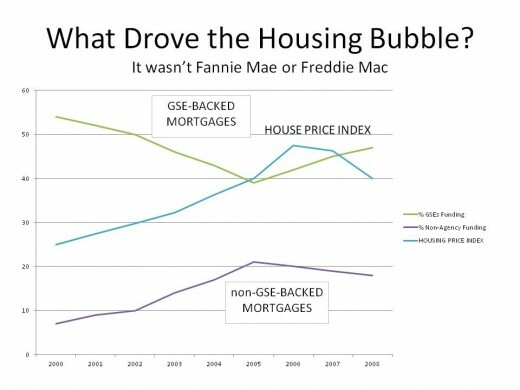 The top chart, labeled "What Drove the Housing Bubble? ", depicts two of the major sources of funding for all mortgages, GSEs and what became known as "shadow-banks" as well as an index showing the change in housing prices for 20 major metropolitan regions, the Case-Shiller Index. (I divided the actual index numbers by 4 to make the chart more readable, but it doesn't effect the results. There is a third major source of funding, regular banks, but their share hovered around 30% from 1985 to 2000; only GSEs and non-agency sources changed dramatically. The second chart, labeled "Who Bought the Sub-primes", depicts which agencies purchased most of the sub-prime mortgages over time; another finger pointed at the GSEs by Conservatives as the cause of the bubble and the recession. First, let me explain what the chart doesn't show. It doesn't show that the Housing Price Index from roughly 1990 to 1998 grew from about 20 to 21. It doesn't show that 1) prior to 1985, there was no "shadow banking", non-bank institutions performing banking functions, 2) from 1985 to 1990, the "shadow banks accounted for only 1% of all mortgage funding, and 3) from 1990 to 2000 they accounted from between 1% to 7%, the increase coming mainly from the savings and loan industry. Finally, from 1990 to 1994, GSEs grew from about 40% to 50% of funding as the S&Ls crumbled from the savings and loan crisis of the 80s. So, what does the top chart show? It should be obvious that, from 2000 on, until the collapse, the "shadow banks" were taking over the mortgage market. In the space of only five years, these non-agency institutions went from providing 7% of the funding for all mortages to 21%! At the same time, the GSEs fell from 54% to around 39%!! Not quite the story the Conservatives want you to believe, is it? Now, the "shadow banks" weren't taking business away from the GSEs, instead, because they were unregulated and because once they originated the loans, they sold them and therefore had zero risk in the loans they made, there "due diligence" in making the loans became almost non-existent. As 2005 approached, if you breathed, you could get a loan from these institutions, something not true from GSE backed banks. As a result, it was so easy to buy a house, and the rates were so low, courtesy of government action, everyone did. Guess what, Demand quickly exceeded Supply and even most high school kids know what happens next. prices rise. It should be clear to all that beginning in 2000, housing prices began to rise, and by 2006, the price of an average house increased 90%, or 15% a year; that, my friends, is a housing bubble. What was it driven by? The only other line that is going up at the same time. How about the second chart? It also points the finger directly at the "shadow banks"; not the GSEs. This chart is easier to interpret than the first so I won't spend too much time on it. The red bar are the "shadow banks", the blue bars are the GSEs. 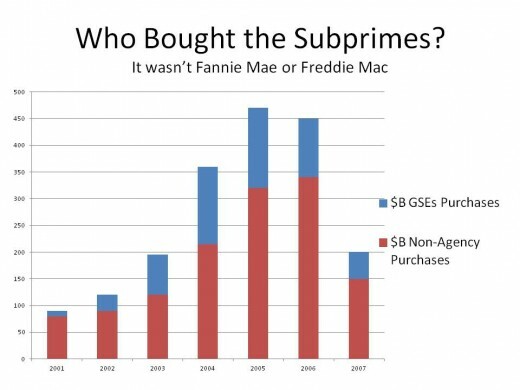 The Conservatives blame the GSEs for buying up all of those nasty sub-primes; clearly, they have it wrong. At its height, in 2005, the GSEs spent a mere $150 billion on sub-primes while the unregulated "shadow banks" spent a whopping $320 billion buying up sub-prime securities; how can you point a finger at Fannie Mae and Freddie Mac with that kind of evidence to the contrary? The report also showed that the GSE sub-prime loans defaulted at a LOWER RATE than those of the non-agency institutions; another nail in the coffin of the non-agencies being the culprit here. What Could Have Alan Greenspan Done? HE COULD HAVE used his authority to control the non-agency institutions; the "shadow banks. This is why I spent the time in the last section pointing out it was the non-agency institutions who were the problem, not the GSEs. If it were the regular banks and the GSEs, Greenspan's job would have been easy; but, it wasn't, it was a miasma of unregulated institutions, making new, dangerous, impossible to follow financial transactions that ultimately led to the great crash in 2008-2009. For most of his tenure in 2000, Alan Greenspan said he did not have the authority over the "shadow banks"; the Financial Crisis Inquiry Report quite succinctly shows that he had sufficient authority to have provided enough regulatory oversight to have mitigated much of the devastation. Greenspan simply chose not to use it. Why not? He didn't think he needed to or should. Remember, Alan Greenspan is an economic Conservative. He believes, at his core, in a laissez-faire government-business relationship. Regulating the "shadow banking" industry is foreign to him, that is not something that is built into his nature. That leads to blindness. This would expain why Alan Greenspan was oblivious to five years of ever increasing evidence that something was going seriously wrong with the economy. The Report supplied piece after piece of reliable testimony which showed that Greenspan was aware of the consequences the unethical practices used by the shadow banks and the "easy money" attitude lenders had taken was leading to catastrophe; by 2005, it had risen to a crescendo, yet Greenspan was still optimistic. After 2005 or 2006, it was probably too late; t takes time for any action Greenspan might have put in motion to have a significant effect. and as we saw from the charts, the economy was already heading downhill after 2006. Why do I focus so much on Alan Greenspan? Because he is the Chariman of the Federal Reserve and the Federal Reserve is charted with oversight of basically all things financial; in short, it was his job to bring the "shadow banking" industry to heel, but, his economic philosophy led him to believe that was not the right thing to do, so he didn't. Therefore, to answer my question in the title of this hub, Alan Greenspan was blind, but not stubborn. His conservative economic philosophy blinded him to the reality of the situation, but, he wasn't so stubborn that he didn't change his opinion in the end, although it was too late. Thanks, Progressivist, I see a hub coming on. That was very interesting testimony that occured before Bush's initiatives that we can now talk about from hindsight. His worry, in this case, was what happens when it got paid off, as it was projected to at the time of his testimony. He also commented on Bush's proposed tax cuts. You can find Greenspan's testimony here: http://www.federalreserve.gov/boarddocs/testimony/... but decoding it (I'm not an economist and I don't specialize in legalese double-speak) would require more of my time than I can devote to it. He was clearly worried about paying off the Federal debt, though! A well written article on a pretty complex and technical subject. You did a good job on discussing the issue and Greenspan's role in it to a level I could understand. Thank you for your comments, HS and Progressivist. I never did understand why Clinton signed that bill. I know it was a compromise and was one of the reasons he was so effective in his other legislative achievements, but I have can't believe how badly he underestimated the consequences. That is a new one for me Progressive, have you written a hub on that aspect of Greenspan? I would be interested in reading it. For most of his tenure, I was a fan of Greenspan, but then his conservative economic philosophy didn't get in the way of most of the other crises he successfully handled; he did a very good job of keeping the money flow in balance. However, this crisis wasn't about money flow, it was about regulatory policy of financial transactions. Excellent analysis MyEsoteric. Greenspan was a strict and blind adherent to Ayn Rand and her strict laissez faire philosophies. This led him to worship the financial community blindly and hence our present downturn. To be fair, the Clinton Adminstration enabled this by siding with him in the late 1990's to dismantle Glass-Steagall. The other thing that Alan Greenspan did was take President Clinton's budget surplus, which would have paid off the Federal deficit, and turn it around. Greenspan was worried that the U.S. would not be able to manipulate the Treasuries market (and indeed, there would be no Treasury notes if the U.S. did not need to borrow money), and therefore convinced President George W. Bush that deficits were, in fact, a good thing.